The radical skin treatment all the stars are using. Gwyneth Paltrow, Jennifer Aniston, Brad Pitt, Angelina Jolie, Demi Moore, Kim Kardashian and a host of other stars all swear by microneedling. The skin is pricked with tiny needles that reach the dermis. This tricks your body into thinking it has been wounded and it produces new collagen and elastin. We apply skin serums immediately after microneedling. For a very short time tiny channels are still open making any treatment hugely more effective. Younger, firmer, thicker, more flexible skin. It smoothes out lines and wrinkles and evens skin tones. It can also reduce the appearance of scars and stretch marks. It’s a device that vibrates microneedles vertically at variable depths and speeds. 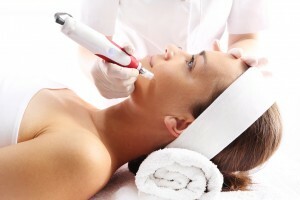 This is a much safer and more effective treatment than the old derma-rollers. Prices range from £150 for a single treatment to £130 per treatment over a course of six. Treatments can be anything from one week to six weeks apart. Where can I get Dermapen microneedling? Roberts McCarron is the only skin clinic in Barnsley performing Dermapen treatments. Our Clinic is on Huddersfield Road. Ask us any questions you like or arrange a free, no-obligation consultation with our clinical aesthetician, Allison Roberts. Get in touch below.